Super quick post tonight as I am teaching a class very shortly. This is the second to last card in my Basic Grey Serenade series, and tomorrows card is a special one.. 6′ pad, a sticker from the matching sheet, and some ribbon and bling, all mounted on a kraft cardstock base. Til tomorrow….. Basic Grey Serenade #3 and musings on styles…..
Today is number 3 in my Basic grey Serenade series – the 6″ pad and I have cut my leftover scraps into banners, stamped a butterfly, coloured it and mounted onto a canvas circle, added some Kaisercraft Rhinestones and a huge floppy double seam binding bow! I have been in the craft room today making my favourite syle – Vintage, and it got me to thinking – What are my 3 favourite styles, and how do I define them? I thought I would share my thoughts so here goes – Number 1 favourite style – vintage – my definition – soft subtle colours,with lots of ribbon and lace. Number 2 – Shabby Chic – same as vintage but with the addition of inking, ripping and distressing ( took me a while to master the ripping – I couldn’t bring myself to do it at first, but nothing stops me now! )and 3rd favourite style – Homespun which is totally different to vintage and shabby chic as it involves bold bright primary colours, buttons, bakers twine ,ric rac,and simplistic images and possibly some paper piercing and sewing as well.What are your favourite syles, and how do you define them? I would love to hear from you all…. Til tomorrow…. A mens card today! 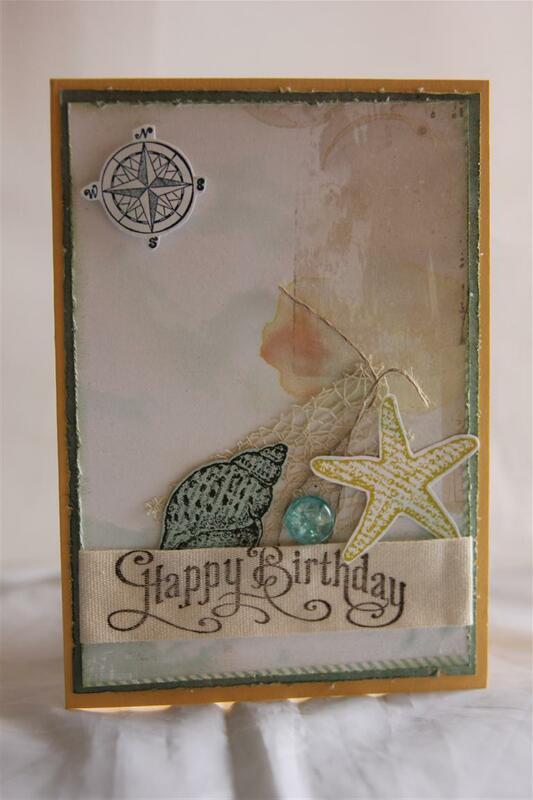 Basic Grey serenade 6″ pad, stampin Up cardstock, perfectly penned stamp( for the sentiment) and Stampin Up by the seashore stamp set for the shells. I stamped one image on cream cardstock, and the other on patterned paper. 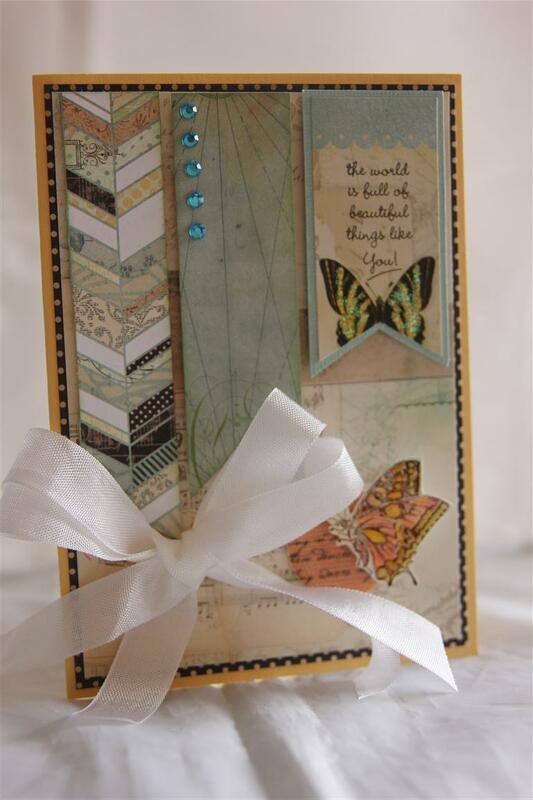 I like stamping on patterned paper, and it worked well in this case. I have spent today setting up a class for the retirement village, I might head into the craft room now for a short while, but I think tonight is going to be a lazy one in front of the T.V. Til tomorrow…. 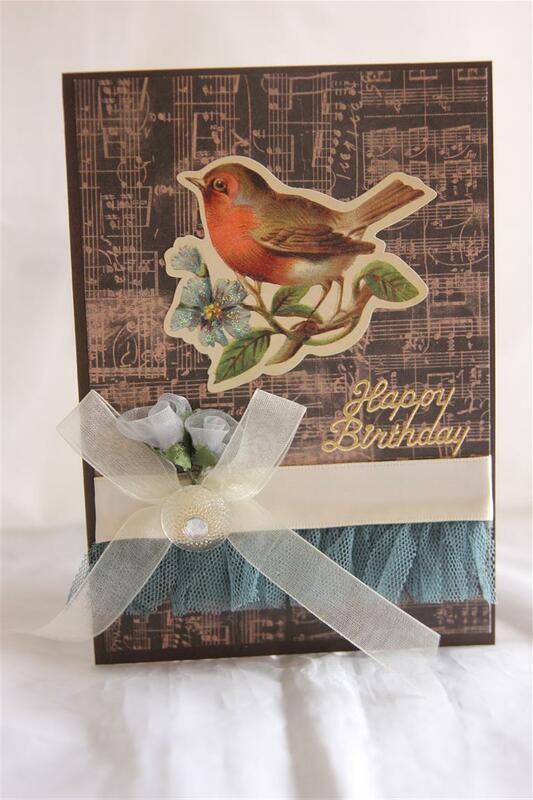 This collection of paper is Basic grey Serenade, and I have used the 6″ pad on all the cards I made with this collection. 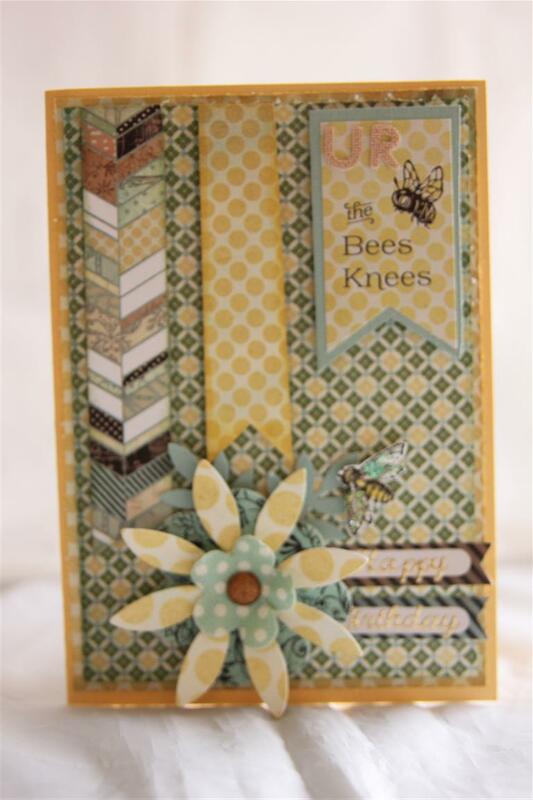 I ran with the Bee theme, and used some of the papers that resembled bee hives, and cut them into strips , and the die cut flower is from a packet that is part of this collection. 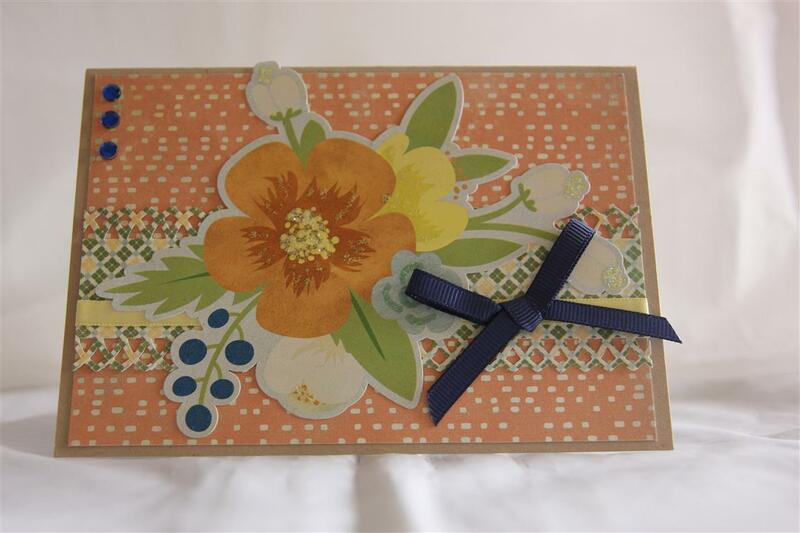 I stamped another bee to add to the flower, and punched a couple of leaves with my Martha Stewart frond punch.I inked all the edges with Stampin Up so saffron ink, and that is the cardstock used as well!Tea is ready, so i have to run – Til tomorrow….